Following the successful CCF counter attack at Hoengsong, UN forces withdrew to the Wonju Line. NK divisions forced withdrawal of ROK divisions in the east to some extent, but this area did finally stabilize. 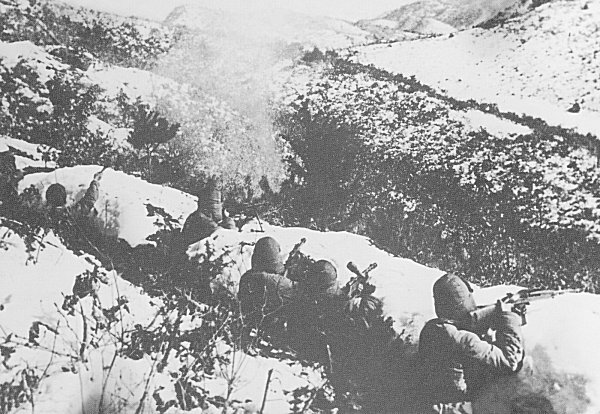 In the west, the CCF exploited a gap in the line to threaten encirclement of Chipyong-ni. Held principally by the 23rd Regimental Combat Team (23d Infantry, French battalion, 1st Ranger Company, 37th FAB, and later supported by pressure on the CCF flanks from the British 27th Brigade and Task Force Crombez), they were attacked by four regiments from four different CCF divisions. In severe fighting, these forces did successfully defend Chipyong-ni. Throughout the fighting, strong air and artillery support inflicted heavy losses on the attacking CCF and NK troops in both east and west sectors. Early in the Chipyong-ni battle, three CCF regiments from the 120th and 117th divisions advanced in column toward Wonju in the face of this scalding fire, taking very severe casualties before finally faltering and ceasing to attack. Such assaults were very successful against the overextended Eighth Army in northwest Korea, but against entrenched forces they were little short of suicide. 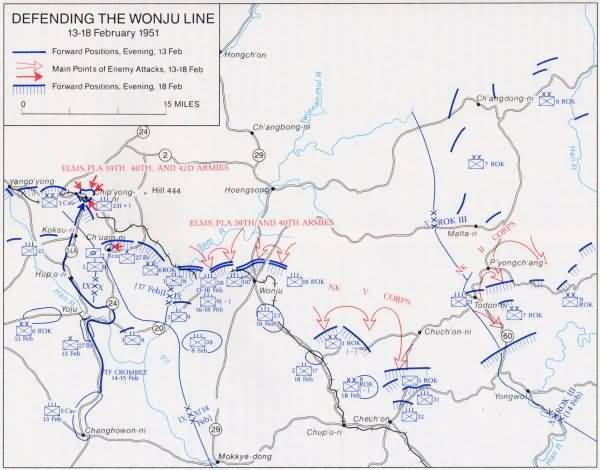 General Ridgway considered the battle and the overall defense of the Wonju Line to be a turning point in the campaign, in that he felt the successful defense by one isolated RCT against numerically far larger forces symbolized a revitalization of Eighth Army as a whole.